What is a British-Style Brass Band? The Brass Band dates back to the early nineteenth century and England’s Industrial Revolution. With increasing urbanization, employers began to finance work bands to decrease the political activity with which the working classes seemed preoccupied during their leisure time. Thus, the brass band tradition was founded. Taking advantage of improved mechanical skills and the rise of conservatories and music departments at universities, the standards of instrumental technology and performance quickly improved. By 1860 there were over 750 brass bands in England alone. Although these bands were not fully comprised of brass instruments until the second half of the nineteenth century, the tradition developed to the present day current instrumentation of cornets, flugelhorn, tenor horns, baritones, trombones, euphoniums, B♭ (B-flat) and E♭ basses and percussion. Contests are the lifeblood of the brass band world and rivalry has always been strong; cash prizes providing additional incentive. Nineteenth-century politicians hired bands to enliven campaigns and challenges often followed. By the 1840s, a thriving local contest circuit had grown. Brass bands in the UK presently number over 5,000 with many of the bands having origins prior to 1900. Originally the bands were funded by coal mines and mills, and many today retain corporate sponsorship. English brass bands are also popular in Japan, Australia and New Zealand; and in recent years a large number of brass bands have started in several European countries. What makes the brass band unique? All the brass music (with the exception of the bass trombone) is scored in treble clef, a characteristic that over the years has allowed for remarkable freedom among certain bands, making the transition from one instrument to another somewhat easier. The number of members (instrumentation) is rigid, usually limited to between twenty-eight and thirty players, but the repertoire is unusually flexible, with concert programs consisting of anything from original works, orchestral transcriptions and featured soloists to novelty items, marches, medleys and hymn tune arrangements. 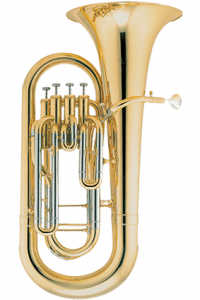 With the exception of the trombones, all instruments are conical in design, producing a more mellow and richer sound, yet one that has wide dynamic and coloristic variety. The term “brass band” is not entirely accurate, since brass bands also normally include up to three percussion players who are called upon to play as many as twenty different instruments depending on the demands of the music. Standard acceptance of more than one percussionist in the brass band is really a phenomenon of the last fifty years, but one that has added immense challenge, interest and variety to the sound. Brass bands are one of the world’s most wide-spread forms of amateur music performance. Although brass bands were an important part of life in nineteenth-century America, they were superseded by larger concert and marching bands. However, many fine historic brass bands are still actively performing there today. 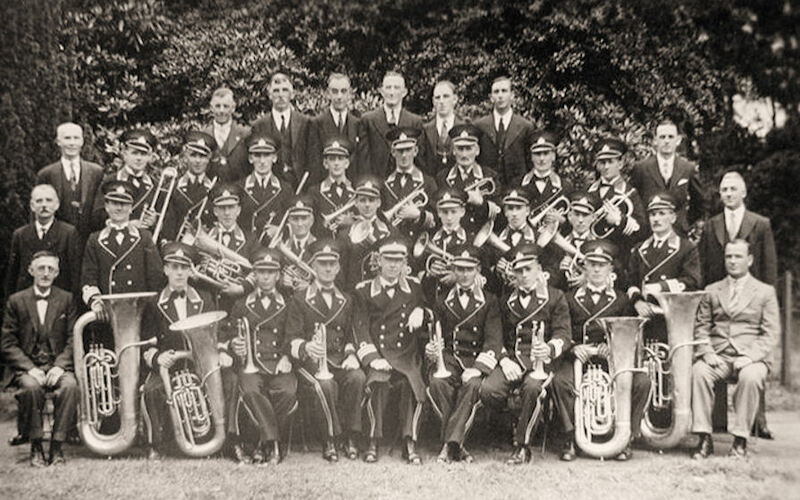 During the course of the last century, the Salvation Army was predominantly responsible for maintaining the brass band tradition in America through their music ministry. Only in the last three decades has a brass band resurgence begun in North America. The formation of the North American Brass Band Association (NABBA) has been crucial and influential in the renaissance. There are presently several hundred brass bands in North America, many affiliated with NABBA, and it is not only exciting to see the tradition making a return, but also such a valuable and unique contribution to the rich musical heritage of the USA. The instrumentation of the brass band begins with one E♭ soprano cornet which serves as the piccolo voice. It requires a delicate touch and is used frequently as a soloist or to add brightness to the cornet tutti sound. Four B♭ solo cornets, or the “front row”, are the lead voices in the ensemble. The use of four cornets permits players to switch off on parts that are frequently continuous throughout the entire piece. Divisi parts are also frequent. The four solo players should ideally match each other in sound. Two B♭ second cornets and two B♭ third cornets, or the “back row”, fill out the cornet section. One B♭ repiano cornet is the “go between” of the section. Often used as a solo voice, or doubling the soprano cornet in unison or at the octave, the repiano is also used to add weight to the other cornet parts. 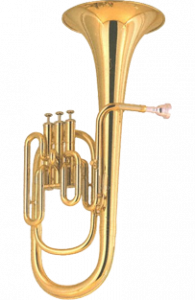 One B♭ flugelhorn serves as a bridge to the tenor horns. It is a frequent solo voice and is often used as the top voice in the horn family. Three E♭ tenor horns (solo, first and second) often perform as a section with flugelhorns and baritones. The tenor horn is a frequent solo voice. Also commonly referred to as the alto horn in the United States, it is an upright three-valve instrument, with a lighter sound than the French horn. 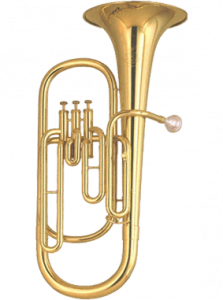 Two B♭ baritones are often doubled with euphoniums but work best as lower extensions of the horn section. As separate voices, their ability to blend and add a middle-low voice without heaviness is a unique feature of the brass band. Two B♭ tenor trombones provide punch and drive because of their cylindrical construction. 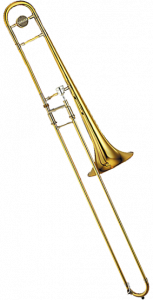 One bass trombone is both a low support for the trombone section and adds additional weight to the bass. As the only brass instrument to be reading in concert pitch (i.e. bass clef), I am not sure what the early designers of brass bands were trying to say! 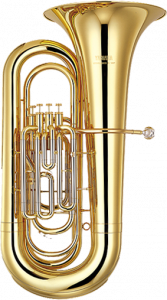 Two B♭ euphoniums are the predominant solo tenor voices and also function as tutti enforcers with the basses. Two E♭ basses and two B♭ basses give composers extraordinary flexibility in dictating the sound of the bass part. The lighter quality of the E♭ basses can have all the lyricism of the euphoniums while the fatter B♭ bass sound adds weight. In octaves or fifths, the section can give the brass band an incredible richness of tone and depth. Three percussionists will cover the entire spectrum of percussion instruments. tympani, full drum kit and tuned percussion are standard for almost all compositions. Copyright © 2019 The Smoky Mountain Brass Band. Powered by WordPress. Theme: Spacious by ThemeGrill.